I’ve just added some screenshots from Crackdown to the site here. These came from a fansite pack that you can download from the official Crackdown site. It’s pretty good, with the screenshots, concept art, art assets for theming your Crackdown fansite, and lots more. Check it out! Last Thursday night I got time to take a look at the Crackdown demo available for download from XBox Live. Crackdown has received a lot of attention in the gaming press and the Halo community due to the inclusion of invitations to the Halo 3 Beta in retail copies of the game. There was an initial impression that the Halo 3 Beta invitations must be a marketing ploy to help sell a sub-standard game. However, it appears that Crackdown can stand on its own two feet. 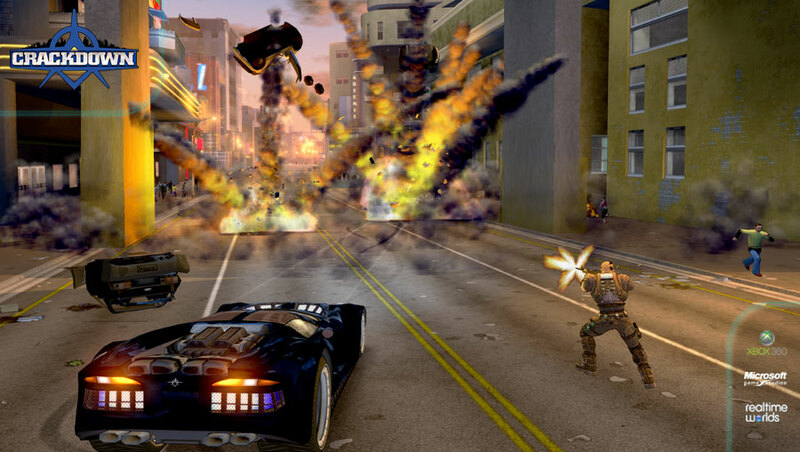 JVB from Podtacular has put together a review of Crackdown. He was pretty impressed with it, and he was one of several XBox community members invited to Microsoft’s headquarters in Redmond, Washington to a special Crackdown community event. You can hear all about their experiences in Podtacular Episode 99. So, I decided to take a look for myself. In the game, you play the role of a genetically enhanced super-cop in a city overrun with crime. Your job is to clean up the city any way you see fit. It’s a sandbox-type game, similar in some aspects to the Grand Theft Auto series of games. You can go wherever you like, and do whatever you want. There are missions and objectives, but you can approach them in whatever order you like, and there are many ways to complete them. The game also has some RPG elements, in that you can develop and improve your character’s abilities. These include skills such as driving, firearms, and explosives, and atributes such as agility and strength. The more you use the skills, the better you get at them. Driving, shooting, throwing grenades, etc., all develop your skills – “skills for kills” as one of the developers of the game put it. Strength is improved through melee atacks and lifting/throwing items. You can build up your strength to the point where you can throw trucks around the place! The agility attribute is possibly the most interesting. You improve it through finding Agility Orbs – glowing green spheres dotted around the rooftops of the city. Finding one of these improves your agility – allowing you to jump higher and further. This introduces an element of platform gaming to the game. Soon you start keeping an eye out for the telltale green glows (easier to see at night), and before long you’re making Matrix-style jumps across the skyline – complete with concrete-crushing landings. It is surprising how quickly you start looking at the city from the point of view of “can I jump up there/that far?” or “how can I get to that orb?”, and of course each time you get another orb, those limits are pushed even further. There’s 500 to find throughout the city, and there’s other mystery orbs to find too. Overall, my impressions were positive about Crackdown. It successfully coveys the impression that you’re a genetically-enhanced super-cop that can do whatever he likes in his attempts to clean up the city. The city itself is well populated, with realistic inhabitants and environments that feel very three-dimensional. Apparently the co-op system is fun, with each participant completely independent and can go wherever they want – they can help their partner too if they want The achivements are supposed to be good too, with fun achievements in there too. For example you get an achievement for climbing up the top of the tallest building (and successfully jumping off it too! ), juggling a body with the rocket launcher, and so on. I don’t tend to buy many games, mainly because I don’t get enough time to play the games I already have However, I’d definitely pick this up if it was on sale, or perhaps pre-owned. For regular game buyers, I’d definitely recommend it. You are currently browsing the archives for the Crackdown category.